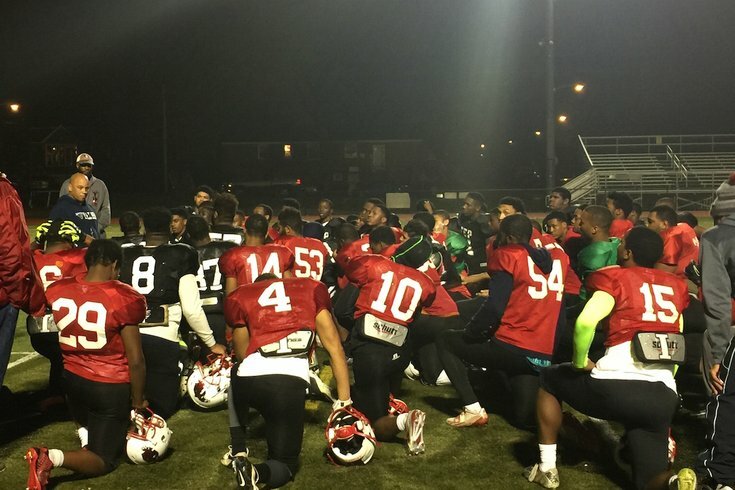 Imhotep Panthers Head Coach Albie Crosby (standing, dark sweatshirt) addresses his team two days before their state quarterfinal playoff game against the Academy Park Knights from Sharon Hill. 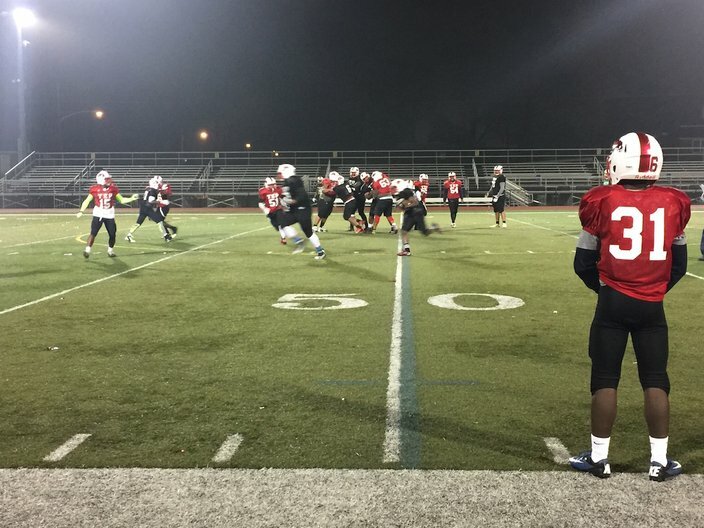 The Imhotep Panthers football team has been where it’s going Friday night, but they’re trying to accomplish what no Philadelphia Public League high-school squad has ever achieved. The burgeoning powerhouse from an East Germantown charter school will face off against the Academy Park Knights (Sharon Hill, Delaware County) in the PIAA 3A quarterfinals. The battle of undefeated teams – their combined record: 25-0 – kicks off at 7 at Plymouth-Whitemarsh High School (201 E. Germantown Pike, Plymouth Meeting). The winner advances to the semifinals the following week and, if they win that one, to the state championship game at Hershey Park Stadium on Dec. 18. In 2013, the Panthers became the first PL team in history to play for that title but went home runners-up after a 41-0 loss to the South Fayette Lions. Now, under the guidance of Head Coach Albie Crosby, they’re again looking to take that unprecedented next step. This week, after defeating Archbishop Wood in a slugfest that lived up to what may have been the most highly anticipated game of the season, they’ve been practicing at the Benjamin L. Johnston Memorial Stadium in a sliver of Northwest Philadelphia sandwiched between Mt. Airy, Germantown and West Oak Lane. Echoing through the air as the sun sets and the stadium lights illuminate have been songs like T-Wayne’s “Nasty Freestyle,” Cool America’s “Make Sum Shake” and Future’s “Last Breath,” which samples the “Rocky” theme. As a slew of assistant coaches works with the team all around the field – and several scouts from big-time college programs taking it all in – Crosby downplayed the importance of last week’s victory. He spoke more about how the program has grown since he came over from West Catholic in 2011. “It’s all about the progress,” he said. The 2012 season saw the Panthers lose in the state semifinals. They advanced to the finals the next year but lost to Wood in the district-title game in 2014. “Year 1, we were new, but we achieved and went 14-1. Year 2, we achieved the goal of reaching the state finals but got outplayed. Year 3, yeah, we had some injuries, but those aren’t excuses,” he said, noting that there were some coaching lapses that he’d like to have back. “But this year, I’ve never had a team this focused. It’s exciting to see. The team is led by a big-boy offensive line that helps get the running game going, tight end Naseir “Pop” Upshur – who committed to powerhouse program Florida State in September – and junior quarterback Nasir Boykin, who transferred from an MLK High program that was the focus of a documentary that appeared in the Tribeca Film Festival. As the team wrapped up its second-to-last practice before the quarterfinals just after 6:15 p.m. Wednesday, Crosby broke down his chances.